For over a year, I’ve had a Skribit widget on the sidebar of the blog; this lets anyone suggest a new idea for a tutorial, and vote on those ideas that others have suggested. 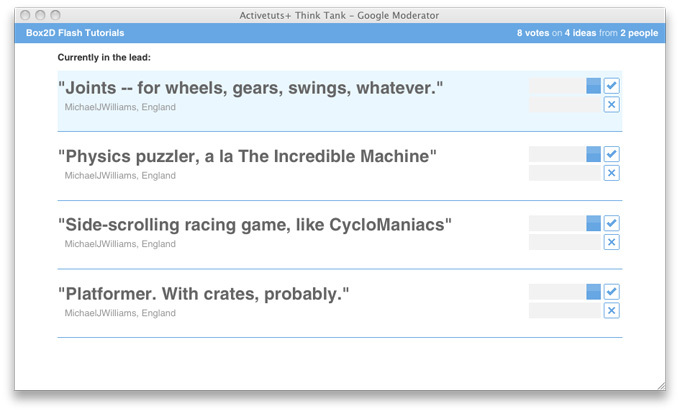 Unfortunately this only keeps track of the last fifteen suggestions submitted, but, because I get an email whenever someone suggests something, I know that the most popular suggestion topic has been physics. “Add physics to the Avoider Game”, “Please teach us a little about physics in Flash”, “Physics would be an awesome thing to learn in ActionScript 3″. So, I’ve started a new series on my favourite Flash physics engine, Box2DFlash. 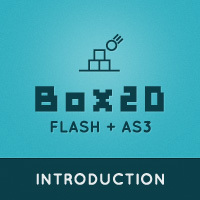 The first part, Introduction to Box2D for Flash and AS3, is already up, and will explain the basic concepts you’ll need. I’ve got the outline for the second part planned, so that should be up soon After that, there are different directions this series could take, and I haven’t yet decided which one to choose. Anyway, I hope you find the first part useful. Let me know if you have any questions! Y’know, since nothing much is happening on this blog anymore, you could just put your entire avoider tut on activetuts, now..
Why not? Your blog (was) a little bit dead. I would like to see some box2d physics integrated into the avoider game to allow cool bounce effects between enemies and avatar/walls etc. Having the assets and base to build on would be helpful in streamlining the tut. Though any of the ideas posted would be very cool. Thanks for sharing knowledge. The second part is out! I’ll do a proper blog post about it when I have time. Thank you so much for your efforts, and the good will for helping us and sharing. You truly rock man! Best wishes. I’ve fallen behind on this, and I’m sorry :/ I’ve been doing a lot of other stuff for Activetuts+ recently, and it’s cut down my free writing time. I’m still working on it, though! Your last comment just dissapointed me, I’ve been on a long vacation, come back, ready for some tuts, and I see, “I’ve fallen behind on this, and I’m sorry :/ I’ve been doing a lot of other stuff for Activetuts+ recently, and it’s cut down my free writing time. I’m still working on it, though!” GGRRRRRREEEEEAAAT! Sorry dude I’m working on the next part. Maybe this week? Best Box2D tutorial ever. All others have very nasty compile bugs.